Enjoy The Strings After They're Done Making Music. Imagine wearing a bracelet, earrings, a wrist band or a pendant made from strings played by a friend, a loved one, yourself or your favourite musician. I custom craft each piece - and will make something expressly for you from strings you provide to me - or from strings I've gathered from my musical friends. I incorporate sterling silver wire and findings, together with natural pearls, Swarovski crystals, several kinds of beads (glass, wood and sterling) and charms to personalize each piece for you - or someone you'd like to gift. Besides jewellery, I also create home decor items such as guitar string baskets, tree of life ornaments and tune catchers. On my Facebook page, www.facebook.com/Encorejewel, I share photos of works in progress and Encore news if you'd like to have a look. Most musical instrument strings are made from very durable materials, so even though they've been broken or no longer stay in tune, they can retain their natural beauty for a lifetime and more, especially if they are taken care of, like any piece of quality jewellery. 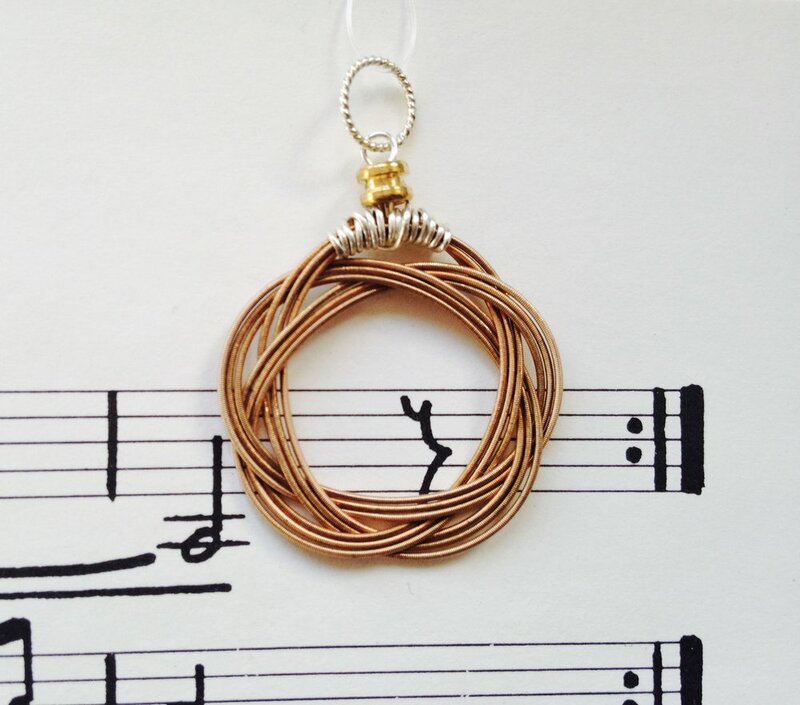 I craft custom jewellery and decorative objects from instrument strings. All the strings I use are repurposed. You can order pieces to the same or similar designs as shown on this web site, or I will create something very special just for you. Custom orders make what I do even more rewarding. You provide the strings and I turn them into something you, or someone you care about, can wear or display in their home. Please feel free to inquire about ideas you have for designs from your strings or something from my stockpile. Contact me here for custom order inquiries.